Susan was born Zsuzsanna Blau on 9th September 1930 in Felsögöd, Hungary. She had one brother, Laci, and lived with her mother and father. She also had a large extended family who she regularly spent time with. Susan became aware of antisemitism in her hometown from a young age. In 1938, her uncle was murdered by Fascists. His attacker was sentenced to just two years imprisonment, and served much less time than that. The attacker then returned to live opposite Susan’s widowed aunt. From 1938, Susan’s brother Laci was also affected by antisemitic laws. He had hoped to go and study at university, but a law restricted the number of Jewish students who could enter higher education. In most universities the limit was set at just 2% intake of Jewish students. Following the outbreak of the Second World War, antisemitism in Susan’s home town became more visible, with anti-Jewish graffiti appearing on the streets and antisemitic propaganda being broadcast on the radio. Physical attacks on Jews also became more common, and Laci was badly beaten at a Boy Scout meeting. The situtation deteriorated further following the German invasion of Hungary in March 1944. Jews had to wear a yellow Star of David to identify them. Eventually a letter was issued by the council for all Jewish fathers to attend a meeting to discuss the welfare of their families. Susan’s father was among those men who went to the meeting, but when they arrived they were herded into waiting lorries and taken to a concentration camp. Susan never saw her father again and still is not sure whether he died in the camp or was deported elsewhere. Under the supervision of SS officer Adolf Eichmann, the Nazis and their Hungarian collaborators organised the deportation of Hungarian Jews: within less than two months from mid-May 1944, almost all Jews were deported, mostly to Auschwitz-Birkenau. When Susan and her family were ordered to leave their home, they still hoped that they would be allowed to resettle elsewhere. Susan took a portable sewing machine with her. Susan, Laci and their mother were all sent to a ghetto in Vác and from there to an internment camp. 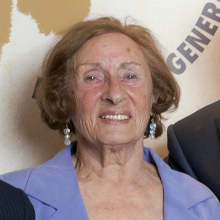 In late May 1944, Susan and her family were sent by cattle truck to Auschwitz-Birkenau. Men and women were separated immediately, and Susan was also then separated from her mother who was sent to join a group of elderly prisoners. She soon learned that her mother had been sent directly to the gas chambers. Susan was selected to work, and remained in the camp for around 10 weeks before being sent to Guben in Germany to work as a slave labourer in an armaments factory. With the Allies advancing, the prisoners were forced on a death march to Bergen-Belsen. On 15th April 1945 Susan was liberated by the British army. After she was hospitalised for tuberculosis, typhoid and severe malnutrition, she was sent to Sweden to recover. After liberation, Susan found that Laci was the only member of her family to have survived: more than 50 of Susan’s relatives had been killed during the Holocaust. Laci continued to live in their parents’ house, although Susan wasn’t able to return to Hungary to visit him for 20 years after the end of the war. During his time at Auschwitz-Birkenau he had been forced to work in the Sonderkommando, moving bodies from the gas chamber to the ovens. He suffered with mental health problems caused by this experience until his death in 1995. After the war, Susan lived in Sweden before moving to Canada, where she met and married a fellow survivor. Susan has three children and six grandchildren. She now lives in London and regularly shares her testimony in schools across the country.